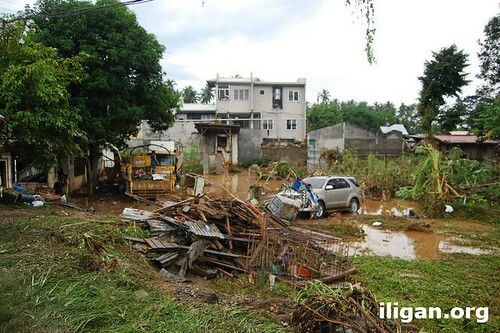 Typhoon Sendong ravaged Iligan City and most of Northern Mindanao in the early morning of December 17, 2011. Initially, I had no idea it was a serious disaster until I went to our supposedly meeting place at Jacko’s Kan-anan in Gerona. We’ve had a planned visitation in Mainit to donate school bags to the kids. 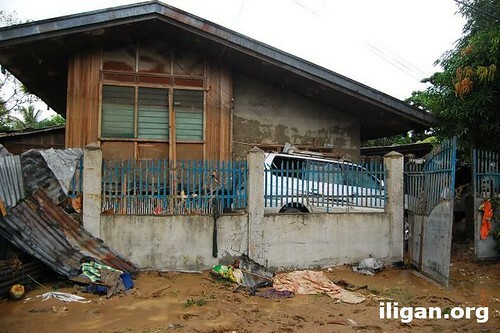 I took the following photos about twelve hours after the typhoon slammed Iligan. 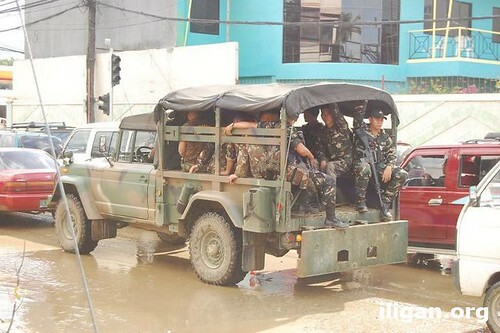 At Mahayahay area, in front of Iligan Capitol College. Inside Iligan Capitol College. Look the floodline on the column at right most. 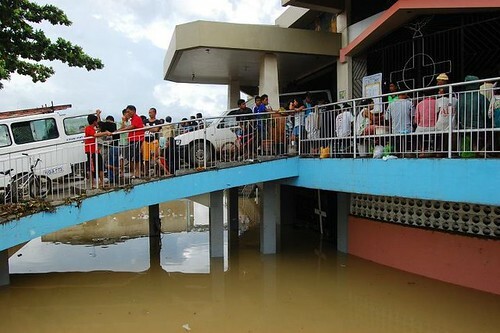 Flood rose up to more than 6 feet at Mahayahay. At Mahayahay area. 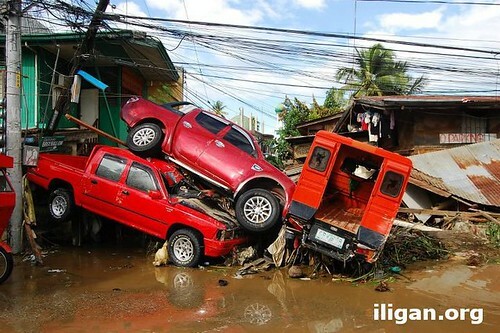 Cars piled up by the flood. 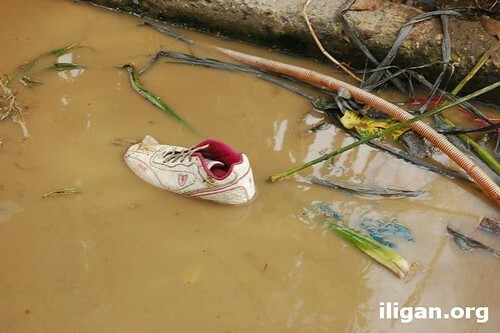 Missing shoe, at the Mahayahay area. God bless the military for the help. 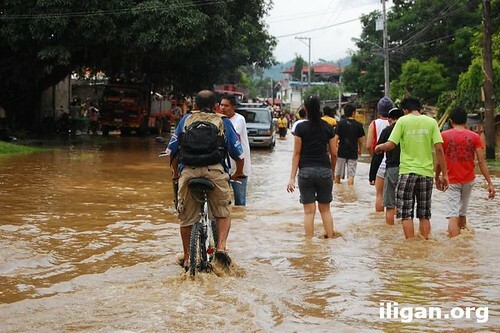 The building at the background is Iligan Capitol College. SURVIVED. They are going to the Hinaplanon area. 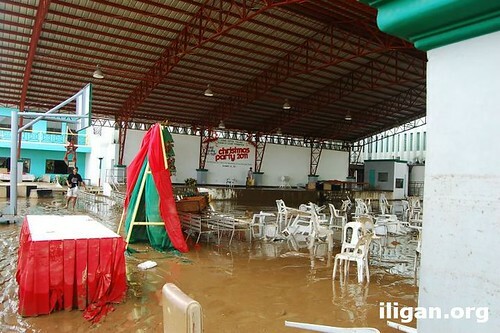 San Lorenzo Ruiz church, makeshift as evacuation center. 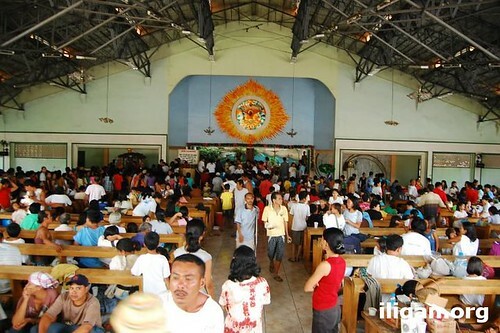 The interior of San Lorenzo Ruiz church, makeshift as evacuation center. Mother holding her baby, blessed to have a living loved one. 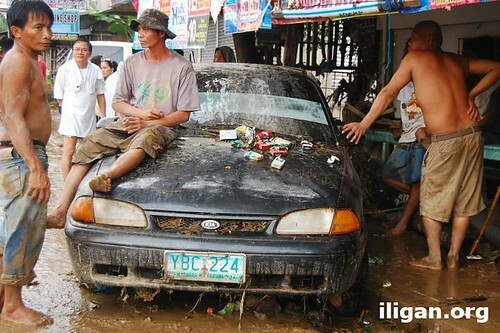 This Feroza car was swept for almost a kilometer away from the owner’s house. At San Lorenzo church in Gerona-Hinaplanon area. My uncle’s house. 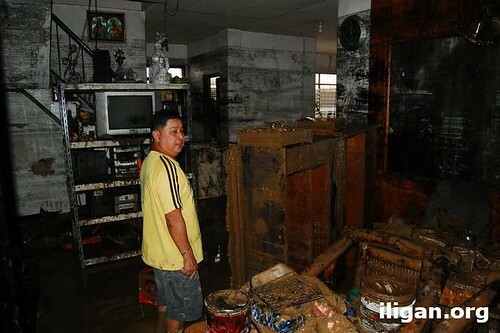 Flood rose up the roof of the first floor (about 8 to 10 feet), approximately just below the floor of the second floor. 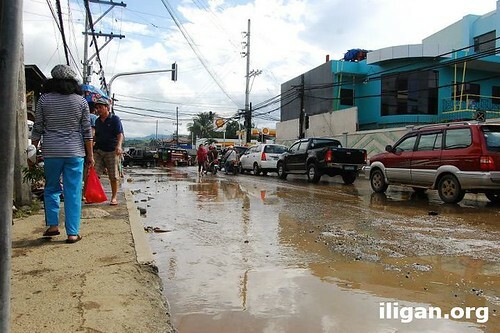 This is at Hinaplanon-Bayug area, close to San Lorenzo church. 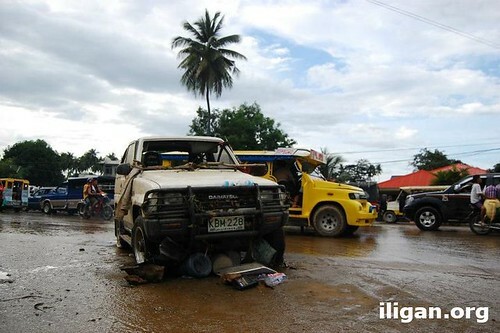 One of the casualties of typhoon Sendong. I gave a little amount for allowing me to shoot them. God bless the military for the help. Near the Hinaplanon Barangay Hall. Inside Hinaplanon. Cars as if kissing each other. 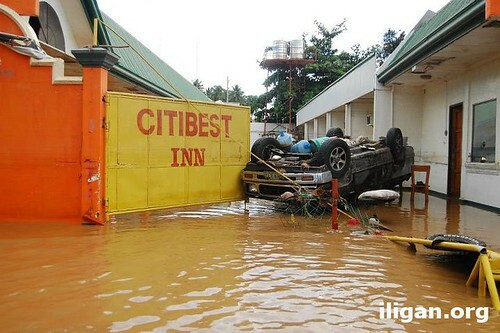 A pickup truck turned upside down in Citibest Inn. In Hinaplanon. Wooden house rammed into a mansion. In Hinaplanon area. 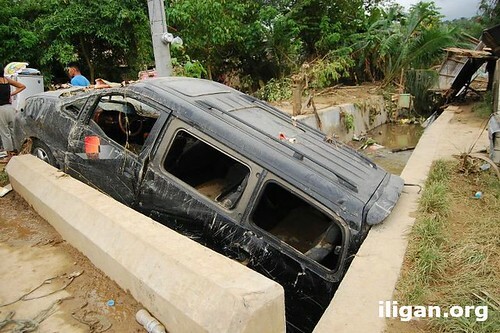 The owner of the Feroza that was swept for a kilometer away. Kia Pride fell into the creek. My uncle’s car swept for about 300 meters away from his house. Cars and trucks fell into a lower leveled area. In Hinaplanon area. 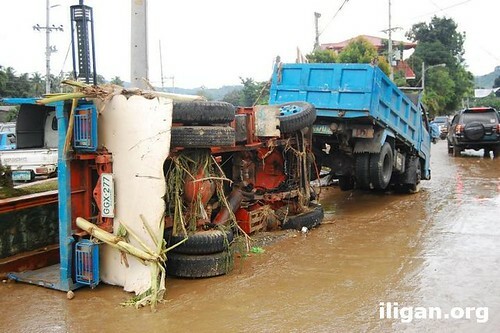 Mini trucks swept by the rushing flood. 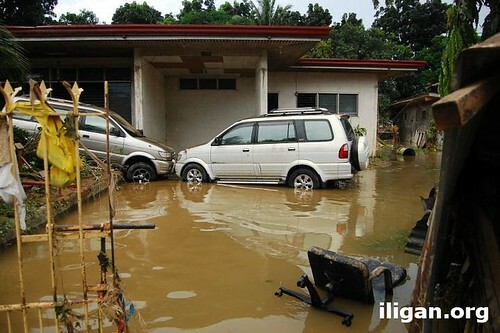 According to some accounts, flood rose up to more than 10 feet in a matter of 10 seconds. Inside the home of my uncle. All of his appliances are probably useless. 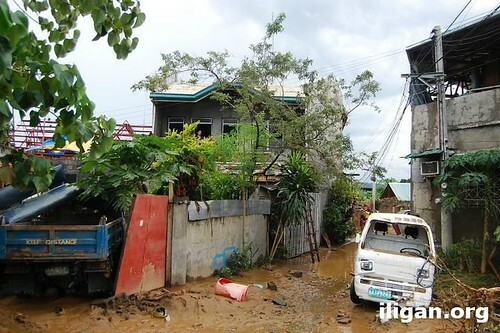 Sendong left with an ankle deep mud. 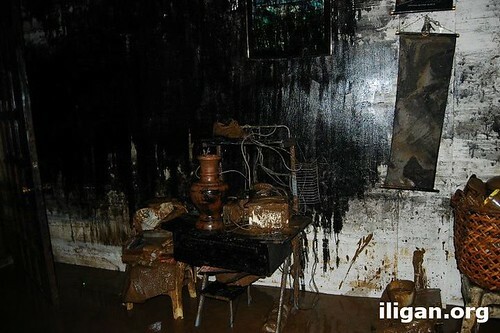 This black color is not paint, but car oil from a nearby car repair shop. 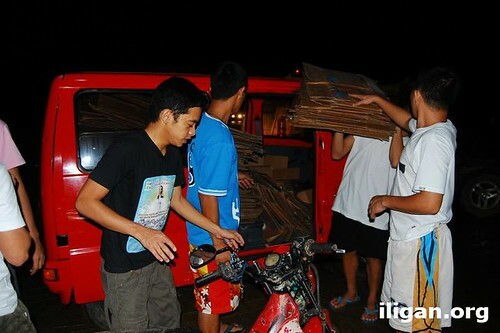 Flattened carton boxes to be used as sleeping matte for the refugees at San Lorenzo Ruiz church in Hinaplanon. 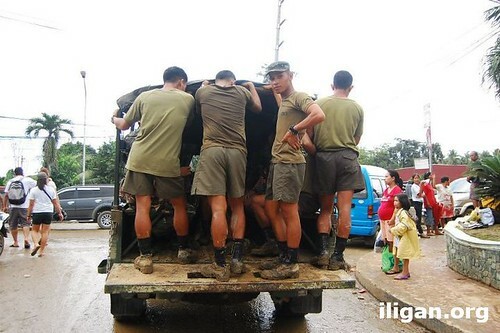 Military personnel carrying goods for the evacuees at San Lorenzo Ruiz church in Hinaplanon. 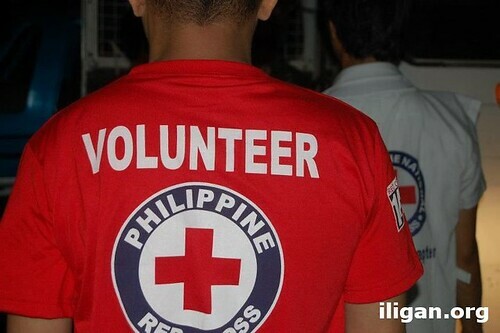 Thank God for the Red Cross volunteers. Owned by a certain Milan in Hinaplanon. 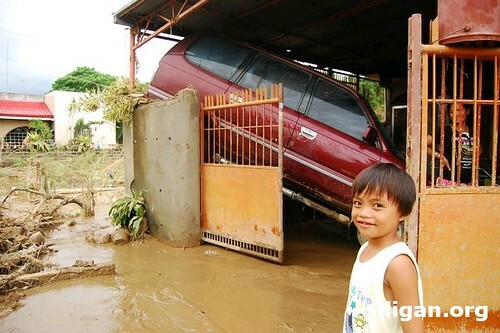 The kid is all smiles despite the destruction all around. Even the lady inside the gate is in positive mood. At the Acedo Compound in Hinaplanon. They’re staying on the roof for the past two days. Black van fell into the creek, in Hinaplanon. This couple is trying to salvage what was left of their home. 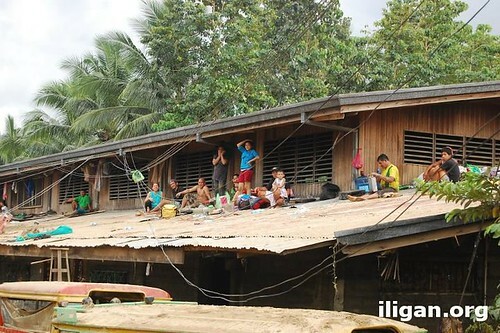 They live just along the riverbanks of Mandulog River. Another angle of the large house with wooden house on its fence. We saw the destructions in your areas – parts of mindanao and visayas, we really felt so sad here in ncr and luzon to see you all there in your ground zero. as ordinary persons, all we can do is to include you and all what’s being done there in our prayers for fast recoveries and all helps to favorably reach your place. we just hope that every leader now in each LGUs in the country now can gather more inputs to be good, proactive and competent in dealing with their localities and take away so much politics. let’s take a very particular considerations on preventions and precautions. 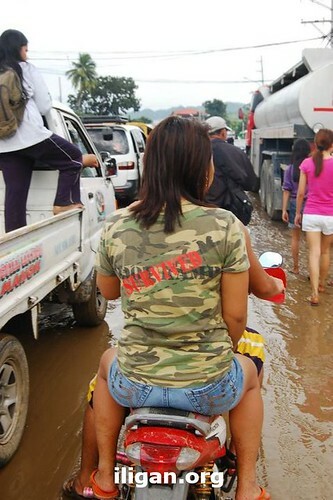 climate change implications are indeed here in our country. 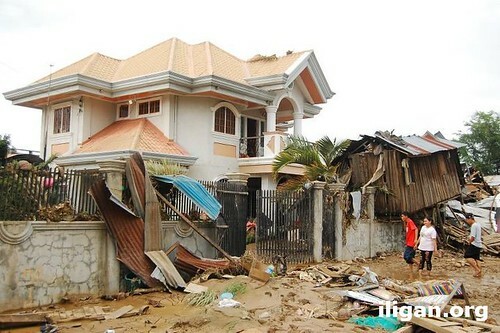 let us adapt to it by building and securing our lives and properties in safe areas. let’s help build a community that is safe and sustainable. as every citizen now should always listen and pay attention to weather reports for us to be able to plan ahead of time. during incoming calamities like typhoons, let’s do away first with some TV and radio programs and pay attention for a while on weather reports of PAGASA. through it perhaps some govt officials can do so much on information dissimination. 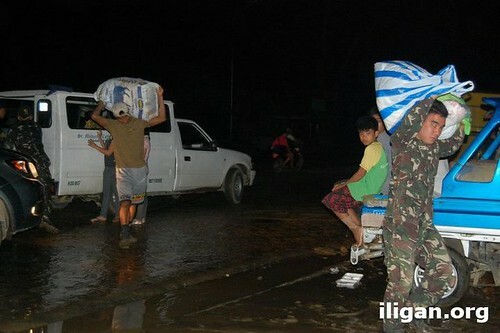 every citizen should no longer be stubborn when it comes to approaching typhoons and other calamities. let’s plan ahead, know our locations, where to go in cases of evacuations, etc. with our condolences and the power of hope be with all there – our brothers. 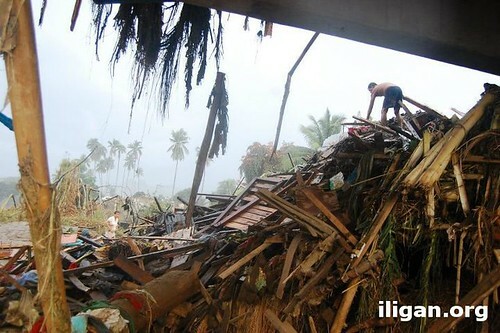 MAY ALL THE HELPS FROM OTHER PARTS OF the PHILS. AND OVERSEAS REACHES YOUR PLACE. THAT NO ONE SHOULD TAKE ADVANTAGE ANYMORE. GOD BLESS YOU ALL THERE AND HAVE HIGH SPIRITS TO RECOVER. Nick Par, thank you for your input and encouragement. 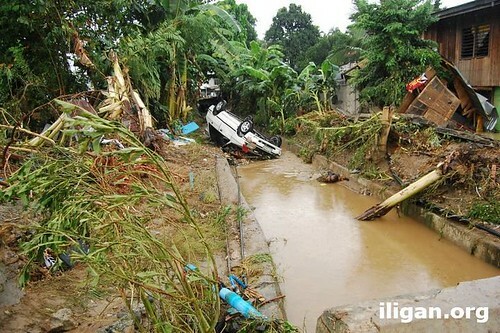 Illigal logging should be taken seriuosly by our government officials…ITS VERY visible to the eye in the aftermath og “sendong”(logs and muds hit houses and people resulting to death and damages).We should plant trees to our mountains to recover what is lost and to prevent floods from happening again.We should support “ONE ILIGAN”…one for all and all for one to the victims! I fully agree with you Sam. 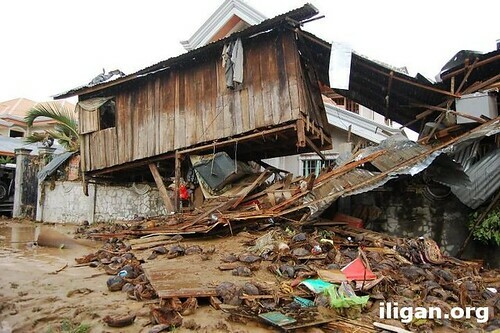 Im appealing for the help and prayers for the fast recovery of Iligan City……. I am appealing too. Thanks Eric. We are a small team based in Singapore currently working on a documentary about survivors. 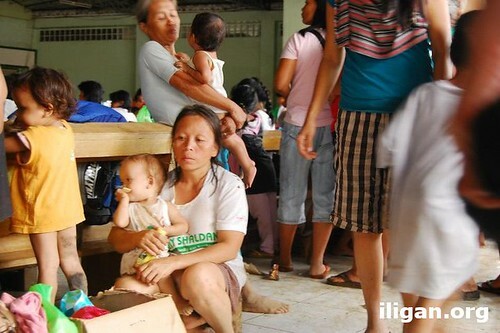 We have interviewed a lady who has survived Typhoon Sendong. We are wondering if we are able to use some of your photos for our documentary. We will credit you under special thanks. Are you a commercial television station? Please email me admin…at…webdeoro.com for further discussion.